On 17 January 2019, Asst. Prof. Dr. Supranee Lisawadi, Assistant to the Rector for International Affairs met with Mr. Kang Byeonggyu, Manager of Office of External Affairs and Mr. Minjoun Shim, International Exchange Coordinator from Kyungnam University, Korea. Both sides discussed on possible academic collaboration, including student exchange scholarship, and Global Hanma Summer Program. On 14 January 2019, Assoc. Prof. Dr. Kitti Prasirtsuk, Vice Rector for International Affairs met with Asst. Prof. Dr. Chidanand Patil, from Central University of Panjab, India and Assoc. Prof. Dr. Nongluck Thepsawadi, former Director of the Indian Studies Center at Thammasat University. Dr. Patil received a short term research grant fellowship from the National Research Council of Thailand (NRCT). Dr. Patil conducts research on using ICT in agricultural development. On 11 January 2019, Ms. Susan Huber Miller, Director of International Education and Dr. Jon Roll, research internships of College of Agricultural and Life Science, University of Wisconsin, USA visited Thammasat University amd were greeted by Asst. Dr. Supranee Lisawadi, Assistant to the Rector for International Affairs. Both sides discussed on academic collaboration and student exchange life at Thammasat University. Moreover, the delegate had a campus tour and also visited Thammasat University dormitory. On 4 January 2019, Dr. Ben Schmidt, Director of Southeast Asia Pacific Cambridge Assessment International Education, Singapore visited Thammasat University. 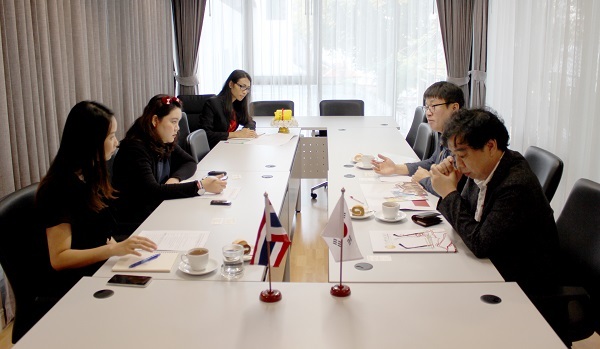 Greeted by Dr. Adisorn Juntrasook, Assistant to the Rector for Academic Affairs and Ms. Supanee Keawmanee, Acting Director of Strategy and Finance office, both sides discussed admission system particularly for international programs at Thammasat University.